A venerable New York City institution, Weaver's Loans, was described as follows when a fourth generation Weaver died (New York Times, 8 August 1962, pg. 32): "Freeport, L. I., Aug. 7 - Richard G. Weaver, a pawnbroker whose family had been in business for more than 100 years, died Friday at his home, 194 Smith Street. He was 51 years old. Mr. Weaver's grandfather founded what is now T. Cohen & Weaver's, Inc., at 594 Ninth Avenue, New York, in 1853. Mr. Weaver sold out about ten years ago and opened Weaver's pawnshop at 8 Church Street here. Surviving are his widow, the former Blanche Gallant; a son, Gerald, a daughter, Mrs. Helen Hagedorn, and his mother, Mrs. Emily Weaver." This account of the Weaver pawnshops seems to be incorrect in one particular. It was not Richard Weaver's grandfather, but his great-grandfather who founded the business. The succession seems to have gone from the founder, Benjamin Weaver, to his son, George Weaver, to his son, Ferdinand G. Weaver, and then to his son, Richard G. Weaver. The founder, Benjamin Weaver (1812/13-1890), received the following notice in the New York Times, 14 Jan. 1890, pg. 5, "Benjamin Weaver, one of the oldest residents of the Twenty-second Ward, died at his home, 315 West Forty-eighth-street, on Sunday morning of heart failure in his seventy-seventh year. He was born is Gosport, England, but was brought to this city when he was but six years old, and was educated and learned his trade, that of ironworker, here. He was an unusually active and energetic man, with a faculty of making money at almost anything, and succeeded in making enough money by the time he was forty years of age to enable him to live at his ease for the remainder of his life. The house in which he died was bullt on a portion of a farm that he bought and tilled nearly fifty years ago. The locality was then away out of town and was known as Lower Bloomingdale. Mr. Weaver was a Mason of many years' standing, and was one of the founders of the Columbia Yacht Club. He leaves seven sons and one daughter. The funeral services will be held at his residence at 1:30 o'clock to-morrow afternoon, and the interment will be in Trinity Cemetery." Benjamin Weaver was identified as a pawnbroker in early New York city directories, including 1857 when the business was located at 408 9th Ave, and 1877 through 1882 when the business was located at 460 9th Ave. He was recorded in the 1880 U. S. Census, age 65, born England, jeweler, living at 355 West 48th St., New York City. Benjamin Weaver's son, George Weaver (1860-1923), succeeded him in the business. He appears in New York city directories from 1892 to 1917 as a pawnbroker at 460 9th Ave. In 1923 the following appeared in the New York Times, 17 Feb. 1923, pg. 13, "Weaver - On Friday, Feb. 9, at Los Angeles, Cal., George Weaver, beloved husband of Margaret J. and father of Marie Schelding, Fred W., John W., and Estelle Ehring. Masonic services at The Chapel, 671 8th Av., corner of 43d St., on Saturday, the 17th, at 8 P. M. Mecca Temple, Corinthian Lodge, No. 488, F. and A. M., are requested to attend. Interment at Trinity Cemetery on Sunday at 2 P. M. Weaver - The Pawnbrokers' Association of the City of New York, with deep sorrow, announces the passing away of our beloved friend and honored member, George Weaver. Members are requested to attend his funeral from Boyertown Chapel, 671 8th Av., corner of 43d St., Saturday evening, Feb. 17, 8 o'clock. Benjamin Fox, President. Jacob Goldschmidt, Secretary." Fred W., mentioned as a survivor of George Weaver, was Ferdinand G. Weaver (1887-1942), usually referred to as Fred G. Weaver in directory lists. Ferdinand G. Weaver appeared in the 1920 U. S. Census, age 33, living at 2025 Morris Ave., the Bronx, when he was a "clerk, loan office." Directories identify him as "Fred Weaver, Pawnbroker" beginning in 1925. He registered for the World War I draft in 1917 when a salesman at Geo. Weaver, 460 9th Ave., and for the World War II draft in 1942, age 56, born 27 Jan. 1887, when he was self employed at 594 9th Ave., New York City. The shop at 594 9th Ave. appeared first in 1929, and remained at that location through 1964. Ferdinand Weaver's son, Richard G. Weaver (1910/11-1962), appeared as "broker" at 594 9th Ave. from 1947 to 1957. In 1961 Weaver's Inc. became T. Cohen & Weaver's Inc. In 1965 T. Cohen & Weaver's moved to 91-13 Merrick Blvd., Jamaica, Queens. In addition to George Weaver, four other sons of Benjamin Weaver, were also pawnbrokers. William Weaver (1836/37-?) and Joseph A. Weaver (1842-1915) took over the shop at 408 9th Avenue in the 1860s. Reuben Weaver (1845-1906) was listed with his father, Benjamin, and his brother, William, and later George, at 460 9th Avenue from 1872 to 1892. Charles Weaver (1856-1924) was listed along with his brothers, George and Joseph A. Weaver, at 726 10th Avenue in the 1890s. The photo above shows the rear wall of the pawnshop at 594 9th Avenue. The street front view of Weaver's Loan Office at this address can be seen in a photo by Percy Loomis Sperr dated 1940 in the New York Public Library's Digital Collections. 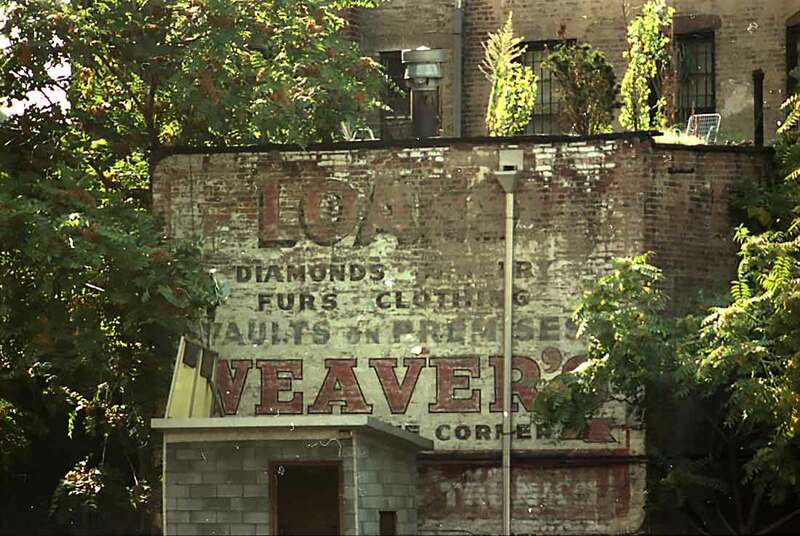 Weaver's, 594, and a large Loans overhang sign are clearly seen.